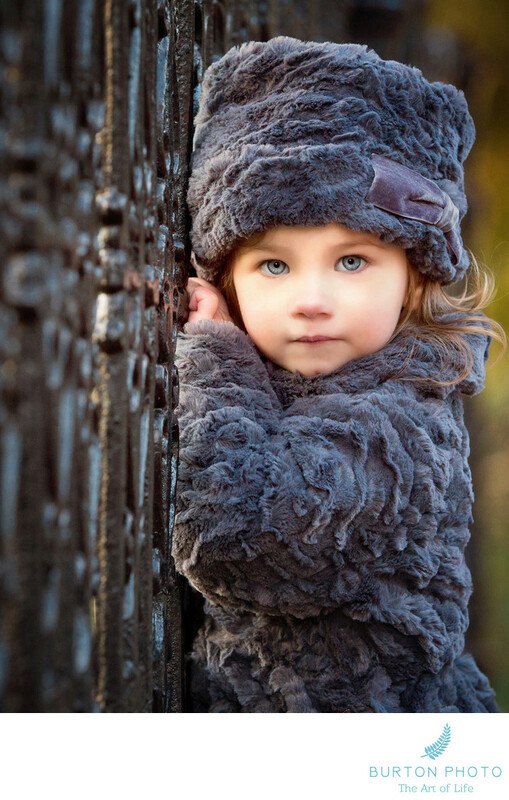 This gorgeous portrait of a 2-year-old little girl in her gray hat and coat was taken on a cold day in January. There were bits of snow on the ground and the chill in the air brought out a bit of pink in the girl's nose and cheeks. The rich blacks and charcoals accentuate the little girl's bluish gray eyes which are just striking. Following the rule of thirds, the viewer's eyes are drawn right to the girl's face and especially her eyes. This portrait received a merit at International Print Competition of the Professional Photographers of America and was accepted into their elite Showcase Collection.